New London — A program that has shown success within the Bridgeport court system could be operating here as early as this spring. Known as the Treatment Pathway Program in Bridgeport, it selectively offers nonviolent offenders who’ve been charged with a drug-related crime or a crime associated with drug use — but not sale of drugs — a chance to go straight into treatment. Here’s how it works: Prior to arraignment, a licensed clinician stationed in the court assesses offenders who appear to fit the program’s criteria. He or she works to determine each person’s history — both judicial and personal — and attitude about recovery, among other things. The clinician then recommends to the court the offenders he or she believes are most likely to succeed in treatment. In those cases, the clinician’s findings supplement traditional background material — age, residency, prior convictions, case details — provided to judges, prosecutors and defenders. Ultimately, whether someone gets to bypass jail in favor of treatment is up to the judge. In the first year of the Bridgeport program, 26.5 percent of those who were screened, or 109 of 411, ended up being admitted. In the state Department of Correction population, between 75 percent and 85 percent of inmates have a substance use disorder — much higher than what’s found in the general population. The New London iteration of the program wouldn’t be an exact model of the Bridgeport one. In Bridgeport, accepted offenders are connected with a nonprofit agency called Recovery Network of Programs, which administers the majority of the city’s services. New London has a patchwork of organizations, from Catholic Charities and Sound Community Services to the Southeastern Council on Alcoholism and Drug Dependence. By all accounts, however, those organizations are up for the challenge. For the project, DeMaio said his nonprofit, which already has a hand in two Superior Court programs, could provide services including psychotherapy and medication management. People who have higher needs, such as requiring a detoxification bed or a place in a residential program, would have to be referred elsewhere. DeMaio said Sound Community Services also is prepared to provide the court-based clinician. Because the clinician’s assessments of offenders would be billable, he said, it’s likely the position could pay for itself. As officials gather data to confirm that, DeMaio said someone in his office is beginning the process to get a mobile license from the state Department of Public Health, which would allow Sound Community Services to operate in the courthouse. According to Charlie Duffy, a longtime volunteer with the city’s homeless population who has acted as a consultant for court programs in the past, the court system is poised to take on the project, too. New London Superior Court “has long been a model … because of the communication between all parties that happens in court in advance of a case’s disposition,” Duffy said. Public defenders, private attorneys, prosecutors, bail commissioners and probation officers all are in regular contact, he pointed out. Bringing a program like Bridgeport’s to New London also would help reasonably expand access to diversion — a path already available to select populations through various initiatives. According to state DOC documents, a goal of Bridgeport’s program was to see whether those suffering from addiction, who generally have lengthier criminal histories and more complex clinical needs than those who aren’t, successfully could participate in a diversion program. So far, the program’s more than 100 participants have appeared in court more and been re-arrested less than is typical of offenders who are struggling with substance abuse, according to project partners. About 81 percent of the 109 admitted clients — 62 of which were diagnosed with opiate dependence while 47 were deemed to be alcohol dependent — gained access to treatment or other stabilizing services within 24 hours. An added bonus is that the program, which began operating in Bridgeport in March 2015 with the help of funding from the Public Welfare Foundation, has been able to sustain itself without such funding since April 2016. That’s thanks primarily to the fact that Medicaid pays for the services into which the offenders enter. According to the DOC, because Bridgeport program participants spent 5,377 fewer days in jail than their counterparts who were screened but not accepted, the DOC also netted almost $737,000 in savings. That’s not to mention the savings hospitals, courts and police departments could achieve by dealing with fewer repeat offenders, Duffy pointed out. “If we can reduce the involvement of people in the system, there’s a savings for everybody,” he said. 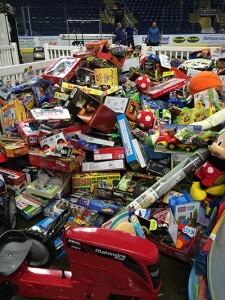 RNP was selected for WPLR’s Annual Holiday Toy Drive.